Baking in Heels: 1,000+ Facebook Fan Giveaway!!!!!!!! IT'S TIME FOR A GIVEAWAY!!!!!!!! A MARDI GRAS THEMED GIVEAWAY!!!!!!!!!!! And Guess who helped sponsor my giveaway? 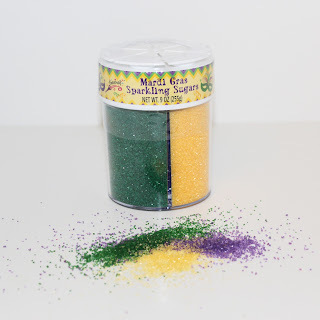 I'm sending the winner a traditional New Orleans Mardi Gras King Cake!!!! You can share the giveaway on facebook or twitter. Come back and leave a comment letting me know you shared. You can follow me here on my blog. Leave a comment saying you follow me. You can follow me on Facebook. Leave a comment saying you follow me on facebook. You can follow Fancy Flours on Facebook....while you're there you can thank them for their donations for my giveaway. Come back and let me know you did so. 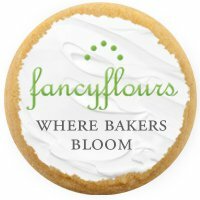 You can follow Fancy Flours on Twitter. Come back and leave a comment saying you did. You can follow Karen's Cookies on Facebook....while you're there you can thank them for their donations for my giveaway. Come back and let me know you did so. You can follow Karen's Cookies Blog. Come back and leave a comment saying you did. Contest is open to US residents with a United States mailing address only. I was not compensated in anyway for this giveaway and all opinions are 100% my own. Winner has 72hours to respond before I must choose another winner. 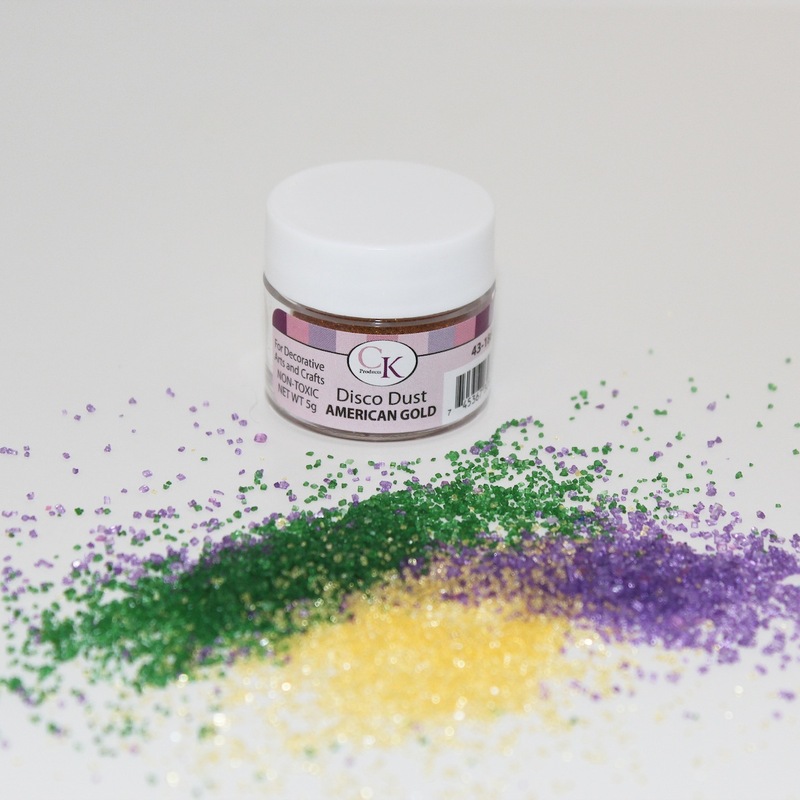 All products will be mailed by me with the exception of the King Cake, which will be sent FedEx directly from the bakery. 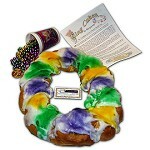 The King Cake is my favorite item. I already follow you, Fancy Flours and Karen's on FB. :) I love love the disco dust shakers!!! Thanks for hosting such a great giveaway!!! Cookie cutters! ESP the gator! Following Baking in Heels On Facebook. I absolutely love the mask!! Its so cute and since so much of my baking ends up with the kids and families i volunteer with it would be interactive and yummy for the kids to have as a baked treat! I love the Disco Dust in green!! Plus the King Cake. I have never had one so it would be fab! The Cajun Cookie Lady loves it all but the mask is my favorite! I follow your blog and your work. They both are amazing! I follow you, Karens Cookies and Fancy Flours all on faceBook, i am subscribed to Karens Cookie blog, and twitter Fancy Flour!!! And I have thanked all for donating to your giveaway! I love your blog!!! I love the cupcake picks! So cute! I also follow you, fancy flours, and karens cookies on facebook. Congrats on 1,000! 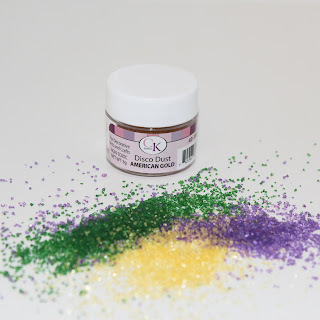 I already follow you on Google Friend and on FB, I follow Karen on FB and just found Fancy Flours. Just keep on posting all your wonderful ideas!!!!! oh I love it all, I cannot win, but would love any of the items! Such a great giveaway. Love it all! 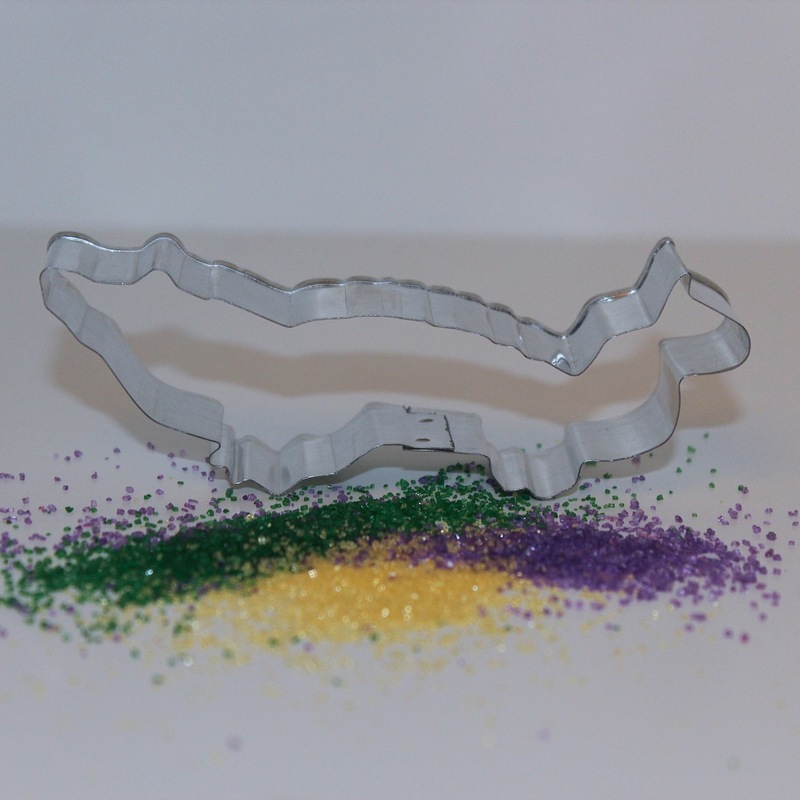 The cutters, sanding sugars, and king cake. I really like those shakers, but the cake gets me most excited. WOW! Great give a way. 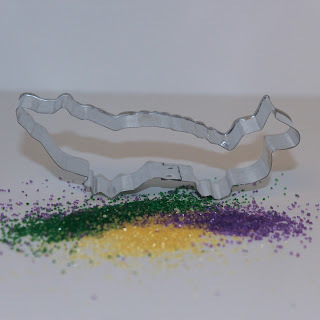 I don't have any Mardi Gras cookie cutters. Would be a great addition to my just starting out collection. Bonus! I follow you on fb too! I Absolutly LOVE the MASK....CROWN...and CUP CAKE PICKS!!! I love th shakers and the disco dust! I haven't been able to find those products near me anywhere!! 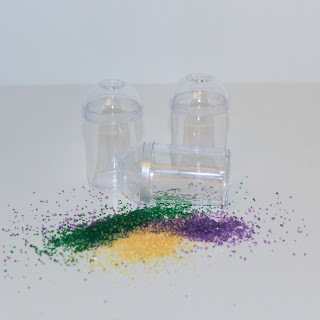 I have been thinking about Mardi Gras cupcakes for weeks, and would love the sprinkles! I love the mask cookie cutter. I already follow Fancy Flours on Facebook. I already Follow Fancy Flours on Twitter. I shared your giveaway on Twitter and on my FB fan page. Of course I follow your blog. It's great! I liked Fancy Flours on FB. I liked Fancy Flours on Facebook. I am addicted to cookie cutters - but I love it all! I already like Karen's Cookies on FB. My favorite item: alligator cookie cutter! I love the three pixie dust shakers! I would use those regularly!! 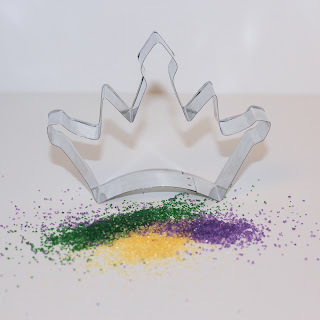 I'm pretty excited about the real King Cake - I've never had a bite of a King Cake. Thank you! I "like" you on Facebook, thanks. I "like" Fancy Flours on Facebook, thanks. I "like" Karen's Cookies on Facebook, thanks. I follow Fancy Flours on Twitter, thanks. i love the mask and crown cookie cutter! too cute. i follow all three of you guys on FB :) thank you for letting the APO-girls join!! I love the mask! It would be lots of fun to make and serve these cookies to my family and friends. It looks great with the sugar sprinkled on it. My fave is the mask cookie cutter. This whole giveaway is too cute! also, I follow your blog. I follow Fancy Flours on Facebook! 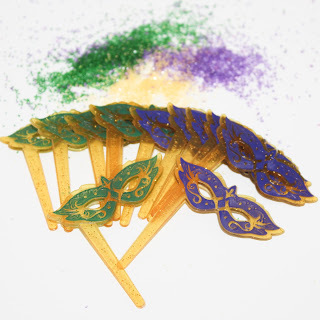 I like the mardi gras mask cutter the best! I follow baking in heels on FB! I follow fancy flours on FB! 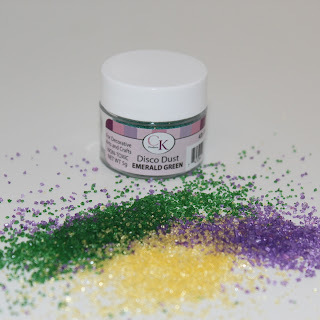 My favorite in the giveaway is definitely the king cake! I haven't had one in years! I already follow Fancy Flours on FB. I posted a thank you on Karen's cookies, and am now a follower on FB! I follow Karen and did thank them! The king cake is my favorite item since I've never tried it!! I liked Fancy Flours and told them thank you! I follow fancy flours on twitter! and I am now following Karen's Cookie blog and even bookmarked it!!! 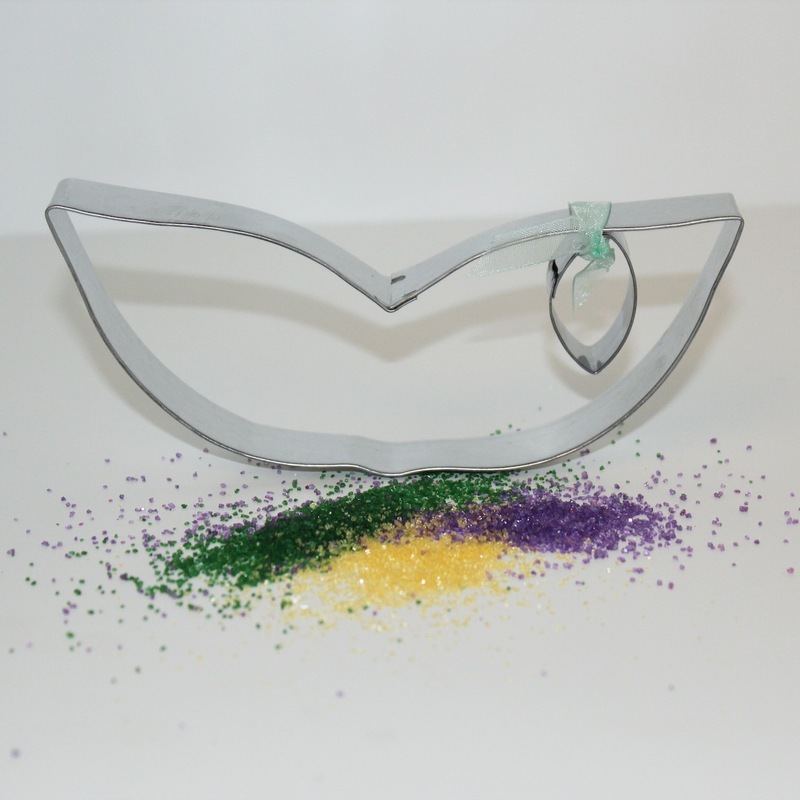 My favorite item in the giveaway is the mardi gras mask cutter. Thanks! Facebook and love your work. I love the crown cookie cutter. Congrats on 1000! Doesn't it free so good! I'm a fan on FB and twitter! My fav part of the giveaway are the cutters because you can never have too many cutters! I did 'like' both Fancy Flours (who I've always been a fan of but wasn't aware of their facebook page) and Karenscookie.net I did not comment on their facebook pages though, because they seemed to be getting spammed already. I did also bookmark Karen's blog which looks great, and I'll be sure to be back there reading shortly. I can only pick one thing as my favorite, huh? Okay, I am going with the gator cutter! Love the mask cutter So fun!!! Love the disco dust . . . I'm a bling girl . . . But I'd like to eat cake too. I follow Karen's Cookies and Fancy Flours on FB as well as you. Love your name! My favorite items are the pixie dust shakers because I need them! Favorite ítem? The cookie cutters of course!!!! 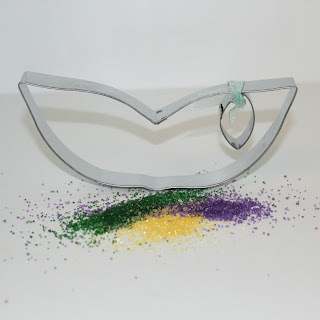 I love the Mardi GRAS mask cookie cutter !!! FOLLOWING U AND SHARED!! :) WANNA TRY THAT CAKE!! U ARE SO TALENTED!! I love the cookie cutters! The King cake is AWESOME too! The crown cookie cutter is my favorite item. Also following Karen's Cookies on facebook too. I follow Karen's blog and on Facebook. you are so awesome! I've been following all of you like crazy. Congrats on your FB following!!! My favorite prospect is getting that cake! Yummm! The New Orleans Mardi Gras King Cake, I have heard so many things about I would love to try it. I follow you on and on facebook, plus I follow Karens cookies and fancy flours. I follow Karen's Cookies on Facebook. OMG! I love this giveaway. My favorite part is the Gator cookie cutter. I have not been able to find one that I liked. Thanks for the giveaway and congrats on the accomplishment. Wow - I didn't know about your blog until I saw on Facebook that Fancy Flours (one of my new favorite web stores) mentioned your contest. I've followed Karen's Cookies blog for a while, but haven't not seen any emails from her in a while, tried to see what she was doing on Facebook. Since I'm so new at decorating cookies, it really helps to have great ideas. I was just getting ready to do some valentine lips - had no idea I should wait a day between the top and bottom! Thanks for the tips! Follow you on facebook, follow Fancy Flours on Facebook, and love the crown cookie cuter! I follow Fancy Flours too! The alligator cookie cutter gets me excited. I picture the alligator from "the princess and the frog". Wasn't he cute? I am most excited about the alligator cookie cutter! I'm following you on your blog, by the way I LOVE the name of your business! Stopped by Karen's Cookies to say thanks, already a fan of hers! 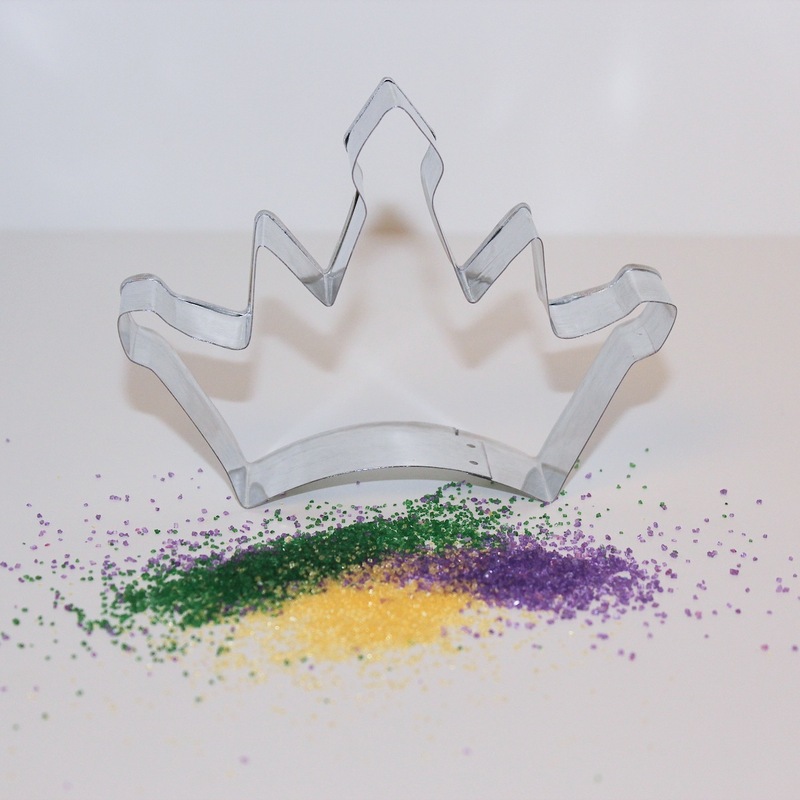 My favorite item is the crown cookie cutter! And I follow you on facebook. I love all the items, they're all so cute. If i haaad to choose it would probably be the cupcake toppers or sprinkles! PS - I follow you on facebook! I've been a fan of Karen's Cookies for awhile now. Love their website. 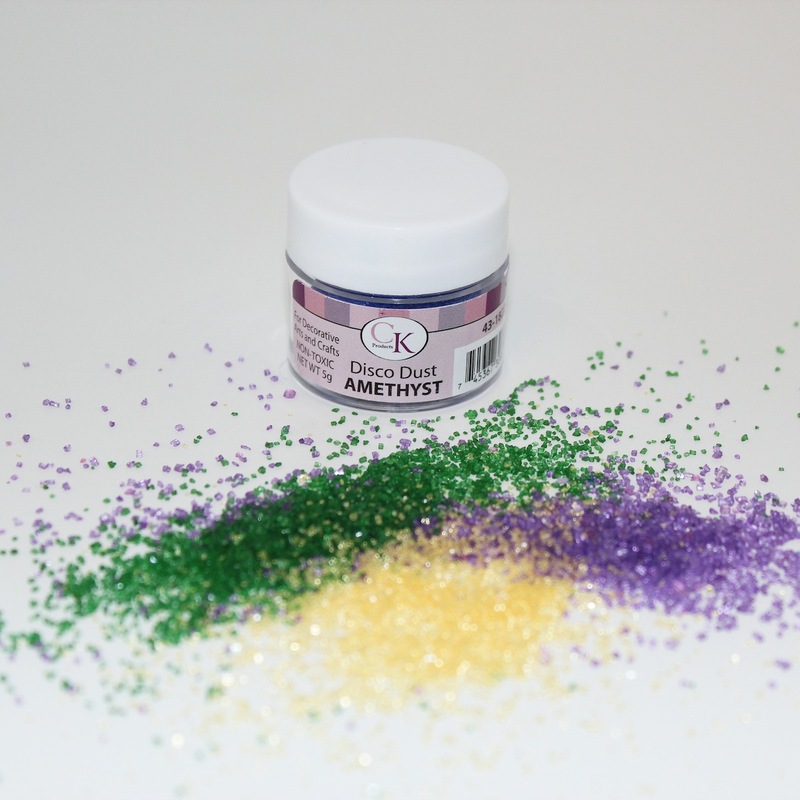 I love the disco dust and what a great giveaway! I follow Fancy Flours on Facebook. I subscribed to Karen's blog! I would be so excited to receive the Kings cake! I follow you on Facebook as well, thank you! I follow Fancy Flours as well, love them! I love the alligator cookie cutter. It's so unique. Now following Fancy Flours on Twitter.